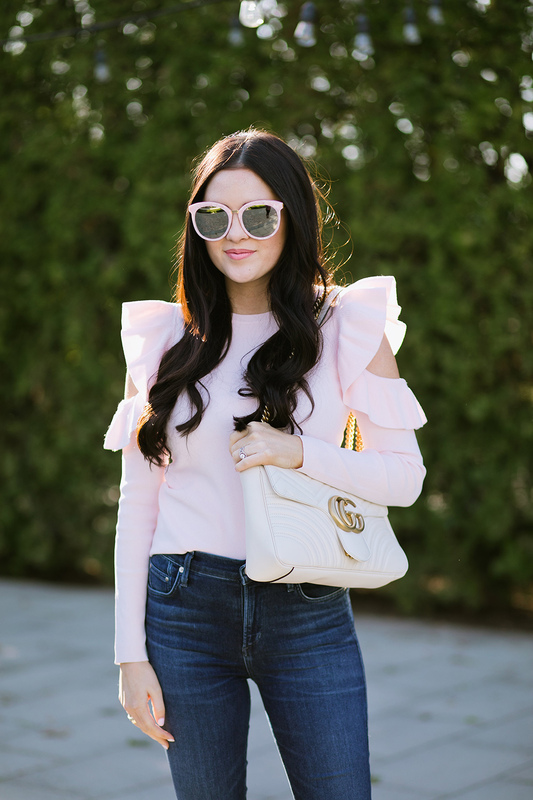 I’m kind of obsessed with the shoulder detail of this top I wore last week! 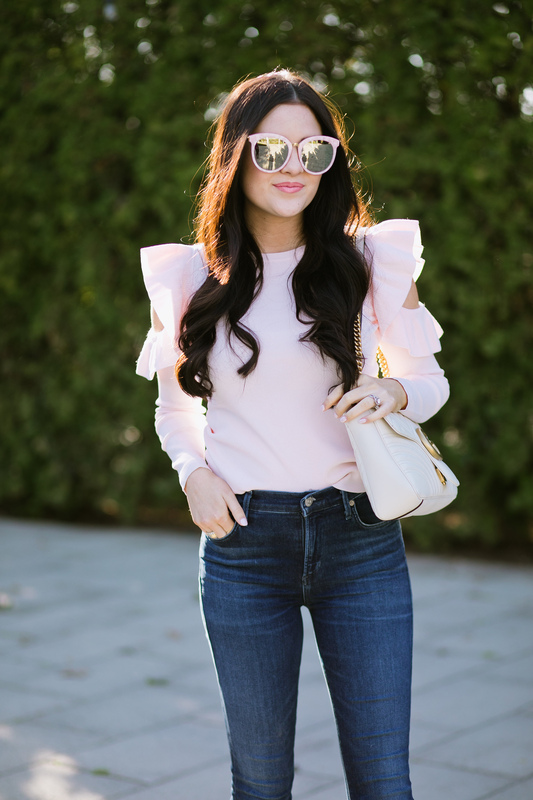 Ruffles are so hot right now and I feel like I can’t get enough of them! 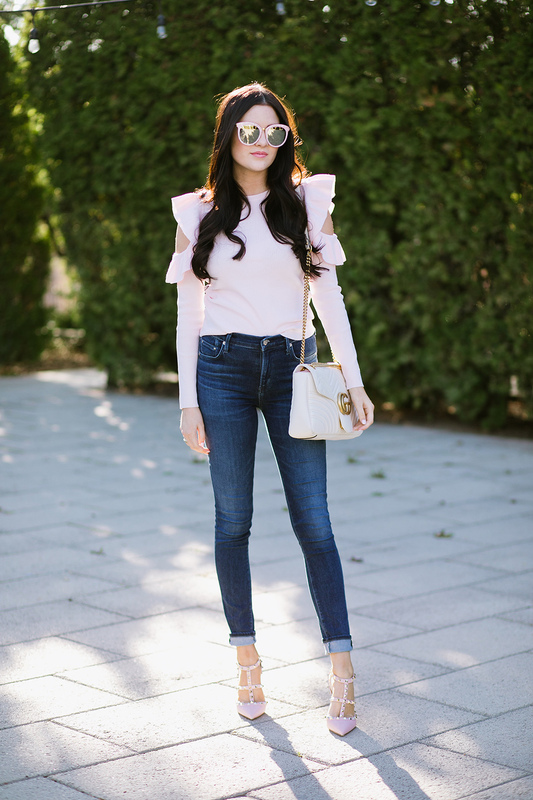 What do you guys think of the ruffle trend? Thanks for stopping by! I hope you have a great Thursday!! Ruffles for work where it has ruffles up the front along the button line. Fantastic sunnies and bag, you’re looking gorgeous in this outfit! Obsessed with your top! 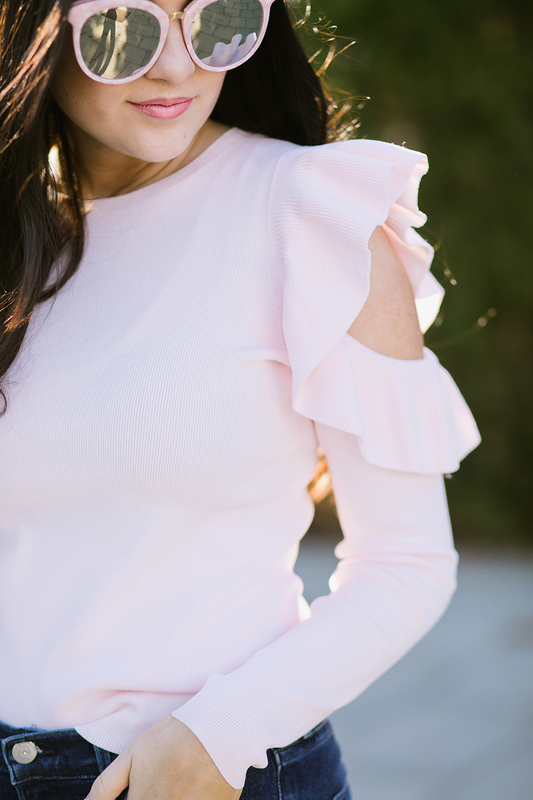 I love the blush color and cold shoulder feature! love this look is much! You look so great in ruffles, I love this simple yet SO chic look! Love the cut and color of those jeans! And that sweater is so fun! I’m obsessed with this sweater! So cute!! Club Monaco always has the prettiest pieces for spring! LOVE this sweater on you! I love the cutouts on this top! Great outfit! http://trendkeeper.me .. blogger tips from a pro! The cutest sweater!! And such a flattering pair of jeans! 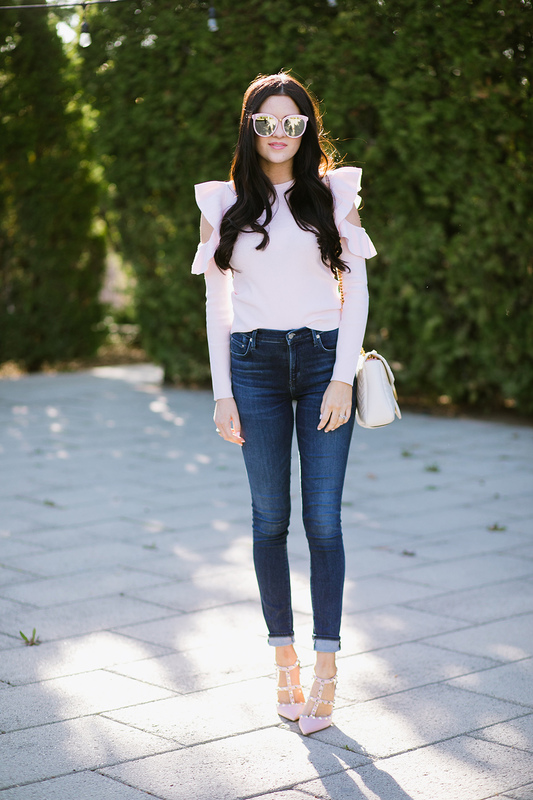 Loving the shoulder cutouts and ruffles! Perfect for spring. And…those heels! What a beautiful top! I love the cold shoulder design wth the ruffle details, so cute and trendy! I also love the addition of the pink sunnies and shoes! Thanks for sharing and I hope you’re having a great week so far, beauty! love the color combo and cuffed jean for spring :) Thanks for sharing! Love the blouse on you!! Love the colour palette, and the ruffled shirt, stunning! I am so in love with this chic and simple look!! Every time I try to shop anything from your website instagram pics it never makes a connection. I don’t use “like to know it” so do you link your instagram clothing on your website or just on like to know it?? Hope this is making sense. When I click your pics on my iPhone 7 at the bottom of your website it just searches to connect and nothing else. Love your sight and style. And esp. your love for family. The easiest way to shop anything from my website would be to click on then link of the item (listed under my photos) or to sign up for LikeToKnowIt. It’s actually really easy to use! Once you like an image on Instagram that I’ve used LikeToKnowIt on, you will get an email with all of my outfit details and links to shop. That blush color is to-die-for! I also am adoring those studded heels. Feminine, but with a touch of edge! Love your style girl. Your heels and bag pair so nicely together! Thanks so much for the suggestions! I love them all! I hope you’ll continue to follow along and be inspired :) Have a great weekend! 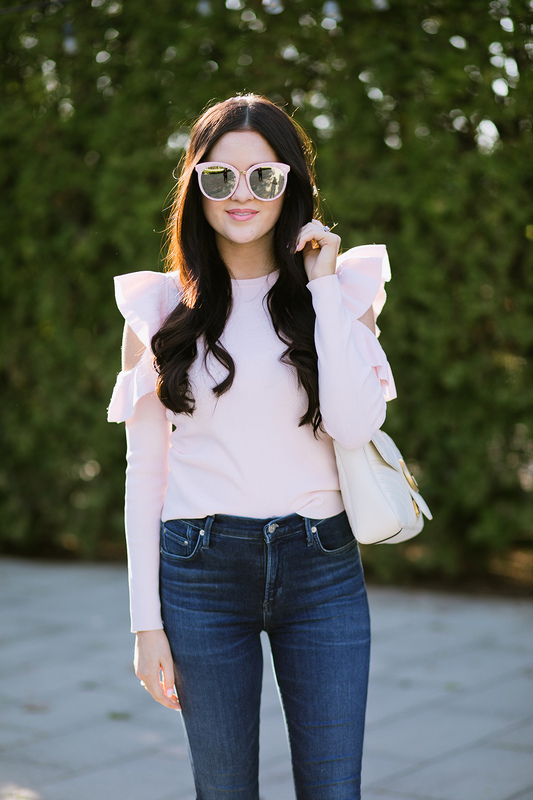 I love this top and the shoulder detail, such a great look for Spring!